Have a Runny Nose in the Morning? Many people wake with a runny nose in the morning. Some people wake up with a stuffy nose every morning. Does this sound like you? Do you get up out of bed and start to move around and start sneezing.? You might wonder for a minute if you are coming down with a cold. But, once the morning routine is under way the symptoms go away. By mid-afternoon you might have even forgotten that you woke up feeling poorly or that you had a runny nose in the morning. Does this describe you or someone you know? The foggy feeling in the head that clears by the time you take a shower? Dust mite allergen is the most common household allergen. Allergy to dust mites is often undiagnosed and misdiagnosed. Dust mites are microscopic creatures closely related to spiders. They are so tiny it takes a very powerful microscope to even see them. However, their body parts and feces contain a protein that can be a powerful allergen and makes it difficult for many people to get a good night’s rest. It can also cause a stuffy or runny nose in the morning. Dust mites feed on shed human skin cells. They like it warm, dark, and humid. Our bedrooms and our beds are the perfect environment for this miniature maker of misery. We wash our clothes every time we wear them. They don’t collect skin cells, so they don’t have much for dust mites to eat. Dust mites don’t want to be in your clothes. However, we sleep on our sheets, blankets and mattresses night after night after night. Because humans shed skin constantly, the bedding fibers trap the skin cells and set the table for the dust mite buffet. We don’t wash our sheets and bedding after each use. We certainly can’t get our mattresses and box springs in the washer either! This is exactly why our sleeping places are literally a hotbed of dust mite allergen. As we move about in our sleep, these particles become airborne and rain down on us only to be inhaled. Once inhaled, the allergic chain reaction begins. By the time the alarm clock goes off and it is time to get up, we have been inhaling that allergen for anywhere from 6 to 9 hours. No wonder you have a runny or stuffy nose! Allergists recommend that you encase your mattress and pillows in zippered dust mite proof covers. All bedding should be washed every 7 days in 140° degree water. If it isn’t possible to get your water that hot (most hot water heaters may be set to 120° or less) you can add something like De-Mite (my favorite) to your detergent to kill those mites. So, if you have wondered why you have cold symptoms in the morning that go away as the day goes on…stop wondering! The next question is what will you do about it now you know the root cause? PS. By reducing your exposure to allergens, you can reduce your need for medications and visits to the doctor. If you want more detailed information, medications and doctor visits, click here to download your free copy of the e-book” You Can Do It! Allergy Free Living”. I have a runny nose in the morning, but only about after 30 to 45 minutes, mainly while preparing coffee and having breakfast. We have no pets, and a very clean house, and change linen in bed weekly. No sneezing, just a very running nose. And how best to cure it? Claretin, Flonase, Zyrtec and the like? Usually having a runny nose in the morning is a symptom of dust mite allergies. That’s exactly what was happening to our daughter before we took care of her bedroom. Even now she has to take Claretin every so often. Does it only happen when you sleep at home? Does an ac vent blow directly on you at night? I had the same for twenty years, it drove me crazy. After two acupuncture treatments, one that treated my sinuses and the second one that treated my stomach/spleen it went away and never came back. Do not take pills, it harms the treatment. I am a clean freak, I awake every morning with a runny nose, it is extreme. I wash my clothes, sheets, and even my mattress cover, buy allergy free pillows and change them every two months, yet the results are the same, I even had a new heating and air system installed with high-quality filters. We even went from a standard mattress to a foam cool gel mattress. same results. The worse is over by about 9 AM then it is a constant drainage in my throat daily, I cough up phlegm all day. I have removed all the carpet in my home and vacuum and mop the floor daily. I will be seeing an ear nose and throat doctor soon. I’m sorry for the very late response. Your comment got caught in our spam filter. One of the things you may want to change is vacuuming every day. It stirs up a lot of the small particles that cause the problems. When you vacuum try to do it early in the day. This way the particles have a chance to settle. if you do it in the evening they settle on you when you are sleeping. Are your symptoms less the morning after you put clean sheets on? Does the vent from your ac blow directly on you at night? When you installed the ac system did they also clean the duct work? If you take your finger and run it along the ac vent does it have dust one it? Have you tried changing laundry detergents? I apologize for the slow response. Your comment got caught up in our spam filter. Since you mention the problem is in the morning you may want to get tested for allergies to dust mites. Cheryl is very allergic to dust mites and when we travel she sometimes has the same symptoms. If it is a dust mite allergy that is pretty easy to control with covers and a couple of small cleaning changes. Writing just to help many others to get rid out of it in a week with no medicine. I suffered with same problem for a decade, gone through expensive medicines and treatments, but never found anything helping more than a week. There are 2 remedies worked for me. First is drink this tea before going to sleep. Boil 3 cup of water, add ginger 2-3 slices and keep it boiling for 7 minutes. Squeeze the ginger and add 1 table spoon organic honey and drink it then go to bed no more food after the drink. Morning, take get two dates and add 2 almonds in each of it, chew well. It worked 100% with me with no nose surgery, no medicines, no expensive treatments. Not really a cure, but I have these symptoms bad too. I find a couple of smudges of vic under both nostrils helps to clear it eventually. It helps clears the head and throat too. A little bottle of Olbas oil in your pocket can help through the day also. Like I said, not a cure, but may help you through the day. Thanks for sharing the tip Mark. When it comes to allergies, you need every tool possible in your toolbox. I get a really bad stuffy nose at night. It started ruining my sleep because I would wake up and not be able to breath out of my nose or only out of one side. I saw a doctor and he told me to take Alegra. It has helped me to breath a little better but I still get the stuffy nose. The weird thing is, in the morning when I get up and shower it starts dripping like water and I’ve had a sore throat for while now. And also when I blow my nose small black specs come out. Any Idea if this is a normal allergy or should I see a specialist? Kirsa, have you first taken the steps to allergy-proof your room? Make sure your room is dust mite free and see if that relieves your symptoms. So, cover mattress boxsprings and pillows. Wash sheets weekly in De-Mite. Don’t have stuff out in the room. The more stuff you keep out the more stuff you have to clean every week. Is it harmful to have these symptoms long term? Is there other problems that can stem from this morning fluid release? 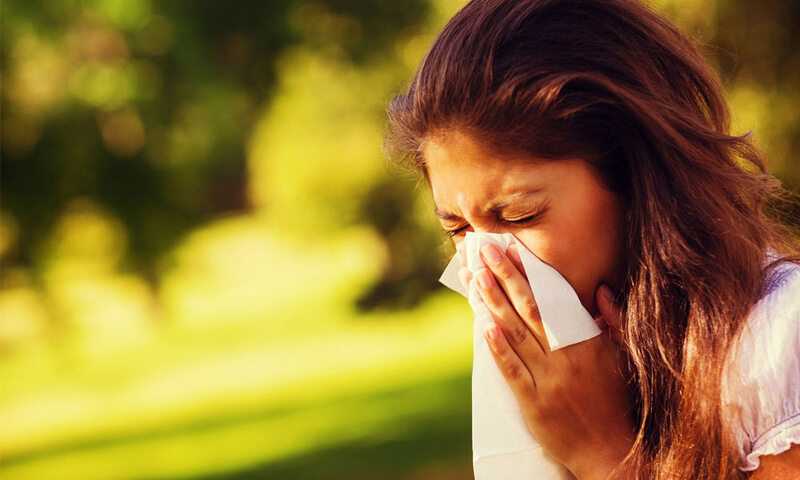 It’s not a good idea to have uncontrolled allergies. It can causes a strain on the immune system. It’s best to get your allergies under control. Not only will you feel better, you will be better equipped to tackle real germs when they come along. I pretty much have the same symptoms as everyone else here but how come it’s just me who have the allergy reactions at home? Charmaine, the other people that live in your house may not be allergic. Or, if they have allergies, hey may have different triggers or different levels of sensitivity. For example, 2 people can live in a house with a cat. If only 1 person is allergic to the cat, then only 1 person will have symptoms. The only relief I can get for sneezing & runny nose in the morning. I have a little tea pot I put warm water & dash of salt and pour it up each nostril to allow the water to come down the other nostril. This can be purchased at the Drug Store. It really works. Next PostNext Can You Get a Fever from an Allergic Reaction?